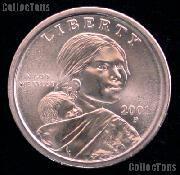 We are pleased to offer for sale this 2001-P Sacagawea Native American Dollar BU. This 2001-P Sacagawea Dollar coin is in Brilliant Uncirculated (BU) condition. All of our Sacagawea Golden Dollar BU coins have nice eye appeal and no major marks or visible problems and represent a great value for the price. These 2001-P Sacagawea Dollar coins are taken from original BU rolls or Mint Sets. The Sacagawea Dollar was authorized by the United States $1 Coin Act of 1997. It called for the replacement of the Susan B. Anthony dollar, which had never been popular, largely due to their similarity in size and metallic composition to the quarter dollar. Although the Susan B. Anthony dollar never achieved popularity with the public, they were used extensively in vending machines, most notably in stamp machines and public transit turnstyles. This demand, combined with the fact that the coin was only minted for three years, caused the Mint to resume minting small size dollar coins. The Secratary of the Treasury, Robert Rubin, had the authority to select the design for the coin, and specified that it should depict one or more women, and that it could not depict a living person. The nine member Dollar Coin Design Advisory Committee that Rubin appointed chose Sacagawea, the Shoshone guide of the Lewis and Clark expedition. After this, invitations were sent to 23 artists with guidelines as to what their designes should show, including that they, be sensitive to cultural authenticity, and try to avoid creating a representation of a classical European face in Native American headdress. The commision chose an obverse design depicting Sacagawea and her infant son that was designed by sculptor Glenna Goodacre. The reverse features a soaring eagle, designed by Mint sculptor-engraver Thomas D. Rogers. This 2001-P Sacagawea Native American Dollar is of great worth and value to the collector or numismatist that needs to fill a hole in their BU Sacagawea Dollar set. The Sacagawea Dollar weighs 8.1 grams and has a diameter of 26.5mm. Sacagawea Dollars are composed of a pure copper core with outer layers of manganese brass (.770 copper, .120 zinc, .070 manganese, and .040 nickel). There were 62,468,000 of the 2001-P Sacagawea Dollar minted at the Philadelphia Mint. Check out all our Sacagawea Dollars in BU condition. Don't miss out on this 2001-P Sacagawea Dollar at this rare low price!